This year the nation celebrates the 200th anniversary of Abraham Lincoln’s birth. Did you know Colorado’s Ute Chief Ouray met Lincoln in person? In the spring of 1863, Ouray and a group of Ute chiefs or headmen traveled to Washington City with their Indian Agent, Lafayette Head. They wanted a treaty that would define Ute land and protect it from the gold seekers and settlers who began invading Ute land in large numbers in 1859. During that trip the delegation met President Lincoln at the White House. Ouray was identified as the leader of the group and Lincoln presented him a silver-tipped cane, his typical gift to Indian chiefs. Ouray insisted that all the chiefs of the various Ute bands must be involved in a treaty decision. Lincoln agreed to send government representatives to Colorado Territory the following October for a great treaty conference. In my 2003 book, Chipeta: Queen of the Utes, I stated that Chipeta and Ouray attended a performance of “The Gorgeous Black Crook” at Ford’s Opera House during their trip to Washington, D.C. Their evening out was reported in the Washington Post, January 20, 1880. 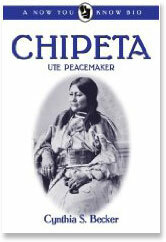 Last year, when I started working on the new middle grade biography, Chipeta: Ute Peacemaker, a photo of the historic building seemed like a good illustration. I had been to Ford’s Theater and assumed “Opera House” was simply an earlir name for the place where Presdient Lincoln was assassinated in 1865. I visited the theater’s website. To my surprise, I learned that Ford’s Theater was closed shortly after Lincoln’s death and remained closed for 90 years. How embarrassing to make such a careless mistake by “assuming”. To make matters worse, a search for information on Ford’s Opera House turned up nothing. Who would know the answer? I recalled a visit to the Historical Society of Washington, D.C. It was a small place but I had found one unique item there – an 1880 Red Book Guide to Washington, D.C. I visited the Society’s website and used the contact link to email my question. Ford’s Opera House was open in 1880 and located on the 200 block of 9th Street, south of Pennsylvania Avenue. The building would later become the Bijou Theatre and was torn down in the 1920’s as part of the Federal Triangle project. The Historical Society has photographs of the Bijou Theatre; one may also be seen in the book “Washington, D.C.: Then and Now” by Charles Kelly.